Pre-foreclosure is the period after the homeowner has stopped making mortgage payments but before the lender has filed a foreclosure complaint. Before a lender can file the complaint, most mortgages require the lender to send a written notice of intent to the homeowner advising them that the loan is in default, the amount required to cure that default and that the default must be cured within 30 days or the lender will foreclose. After the lender satisfies this condition precedent, it may file the complaint. Because of the sheer volume, foreclosure cases are not initially filed in the county court where the property is located. Rather, foreclosures cases are filed in the New Jersey Office of Foreclosure located in Trenton. This allows for faster adjudication of foreclosure cases. Once filed, like any lawsuit, the lender must personally serve the homeowner with the summons and complaint. From that date, the homeowner has 35 days to file an answer. R. 4:6-1(a). The “answer” is a legal document in which a defendant pleads his or her side of the story. In the foreclosure context, if the homeowner has in fact stopped making mortgage payments, few legitimate defenses exist. This is significant because legitimate defenses are necessary for an answer to be deemed “contesting” by the Office of Foreclosure. Old Republic Ins. Co. v. Currie, 284 N.J. Super. 571 (App.Div. 1995). If a “contesting” answer is filed, the case is removed from the Office of Foreclosure and assigned to the general equity court of the county in which the property is located. From this point, the case will proceed as a normal civil equity matter with a discovery period, status conference, and optional mandatory mediation. This is advantageous for a homeowner because it often means more time and opportunity to resolve the matter with the foreclosing lender. If the homeowner doesn’t file an answer within 35 days of being served with the complaint, the case will remain with the Office of Foreclosure and the lender’s attorney will apply for a default. R. 4:43-1. Entry of a “default” renders the case “uncontested” as the homeowner is deemed to have admitted the claims in the complaint. Once the default is entered, no genuine issues are in dispute and there is nothing stopping the lender from proceeding to judgment and foreclosure sale. R. 4:43-2. The filing of a contesting answer accomplishes two goals: 1) it moves the case from the Office of Foreclosure to the county count; and 2) it prevents entry of default by informing the court that there are disputed issues. What to Expect When a Contesting Answer is Filed? As the plaintiff in a foreclosure case, the lender carries the burden of proof. As the defendant, the homeowner has the right to force the lender to meet that burden. To prevail, the lender must produce the original Note and Mortgage and prove: a) standing i.e. they are the holder of the Note and Mortgage; b) that the homeowner signed the original Note and Mortgage; c) the date of default i.e. the date of the first missed payment; and d) the amounts due and owing. After the filing of the contesting answer, the case will enter the discovery phase. During this time, both parties have the right to demand relevant information or documents from the other side. R. 4:10-2(a). The information obtained through discovery can be used by a homeowner to defend against the foreclosure. Experienced attorneys know how to craft discovery requests to suit a defendant’s defenses. After or during the discovery phase, the lender will likely seek judgment via a Motion for Summary Judgment once any meritless defenses are stricken. R. 4:46-1. The homeowner has the right to oppose the Motion for Summary Judgment which can only be granted upon a finding that there are no genuine issues of material fact that the lender is entitled to foreclosure as a matter of law. First Fidelity Bank, N.A. v. Bock, 279 N.J. Super. 172 (App.Div. 1994). If Summary Judgment is denied, the lender will be forced to prove its case at trial. The question most frequently asked by a homeowner in foreclosure is, how long until I must leave my home? While this is a difficult question, the filing of a contesting answer stating valid defenses is virtually certain to slow the process. By filing a contesting answer, a homeowner in foreclosure buys time and opportunity to resolve the matter without entry of a judgment. 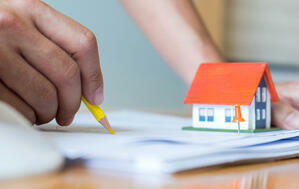 Most lenders would prefer to resolve the case through loss mitigation rather than foreclosure if possible. The most common loss mitigation methods offered are loan modifications, deeds in lieu and/or short sales. The lender will engage in any or all of these loss mitigation strategies while the foreclosure case is ongoing. However, rarely will the lender agree to stay the foreclosure case while loss mitigation attempts are pending. Loss mitigation efforts can be frustrating to a layman, are time consuming and should be pursued diligently with frequent follow up. Successful loss mitigation is optimal though as it facilitates the homeowner remaining in the home and resuming payments or helps the homeowner transition to a new residence without an entry of judgment against them. For the homeowner in foreclosure, time is a precious commodity. Loss mitigation efforts should begin at the pre-foreclosure stage and continue during a subsequent foreclosure case. Our attorneys know the judicial foreclosure process. We can help assert your legal rights while simultaneously pursuing amicable resolution through loss mitigation. If you are facing foreclosure, contact the law firm of Scura, Wigfield, Heyer, Stevens & Cammarota LLP to schedule a consultation.